“One True Act of Patriotism” by Shysti: 3 minutes of hip hop-infused activism and public discontent. Like many of you, I’ve been captivated by how the Occupy Wall Street movement has spread to cities across nation in the past four weeks as the grassroots movement’s message has resonated with an increasing number of Americans. Some related groups have jumped into the fray, such as Occupy D.C., which has been holding marches and meetings in Washington’s McPherson Square, organized via social media. Trendrr reports that Twitter conversations about the protests are producing 15,000 tweets per hour. • The top 1 percent of Americans own 42 percent of the nation’s financial wealth. The 400 highest-income Americans — whose income averaged $227 million each — paid only 21.4 percent in federal income taxes, the IRS reports. And the richest 400 families own more wealth than about 150 million Americans combined. (Can you say, banana republic?) Oh, and you can bet many of those billionaires will be influencing the 2012 elections, with no counter-balance. • Corporate profits have reached their highest level as a share of the economy since 1950s, the New York Times reported Sunday. • Worker pay as a share of the economy is at its lowest point since the mid-1950s. • Top wage earners are paying less in taxes than any time since the 1950s. • Wall Street salaries have risen 11.2 percent per year over the past 30 years, while regular folks’ salaries have risen 1.8 percent, a new analysis shows. • The jobless rate for college graduates under age 25 has averaged 9.6 percent over the past year. • On Twitter: #OWS, #occupy, #occupytogether, #occupywallst and #occupywallstreet. • More than 900 Meetup.com events have been set up — get your Occupy Together widgets. 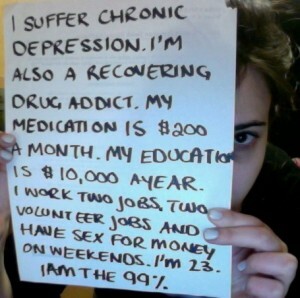 • The WeArethe99Percent blog on Tumblr chronicles the latest activities of the movement. • The Citizen Media Law Project, hosted by the Berkman Center for Internet & Society, has published this Citizen’s Guide to Reporting on #OccupyWallStreet, which can come in handy when dealing with law enforcement authorities who have only a loose grasp of the law. • Occupy Together has 103,000 Likes on Facebook. • The Big Picture has some wonderful photos of the protests. • Here’s a bit more sanitized 30-second spot about Occupy Wall Street on YouTube. • Time: Occupy Wall Street: A New Era of Dissent in America? • Author, Harvard professor (and friend) Lawrence Lessig in a short video commentary on BoingBoing from the protest site in New York, and his Letter to the Occupiers in the Huffington Post. • Kristen Gwynne has a first-hand report of life in the main Occupy Wall Street encampment in lower Manhattan. • Yfrog has some of the We Are the 99% self-portraits. • Countdown with Keith Olbermann: Tom Hayden offers extraordinary insight into evolution of Occupy Wall Street movement. • NBC poll (PDF) finds Americans support Wall Street protests 2 to 1. (37/18) Tea Party viewed negatively (28/41). • Countdown with Keith Olbermann: Michael Moore on support of the Occupy Wall Street protest.JD Lasica, founder and former editor of Socialbrite, is co-founder of Cruiseable. Contact JD or follow him on Twitter or Google Plus. Sign of the times, indeed! If you spot any other relevant apps or posts, please share! Another movement, not directly associated with Occupy Wall Street but closely allied in mission, is Dylan Ratigan’s #GetMoneyOut campaign – ie. of politics – 200k signatures in 2 weeks supporting a Constitutional amendment that prevents politicians from taking any campaign money from any source – http://getmoneyout.com for details. Until you get the money out of politics very little else will get done. I personally think it should form one of the key principles of the Occupy movement.